Isabel Briggs Myers (October 18, 1897 – May 5, 1980) was a psychological theorist who researched personality theory with her mother, Katharine Cook Briggs (1875 – 1968). Katharine’s interest in personality theory was born when she read a book by Carl Jung in 1923. Katharine shared her findings with Isabel and together they created an inventory. They both had a passion for understanding human development and a desire to make personality theory accessible to everyone in a practical way. The free Personality Max Personality Test is based on the research of Isabel Briggs Myers & Katharine Cook Briggs. 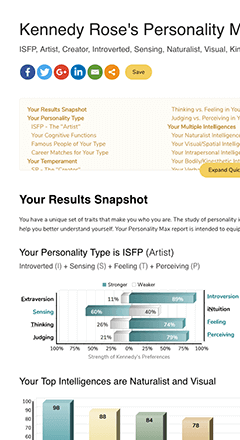 Our test has no connection to, and should not be confused with, the Myers-Briggs Type Indicator® Assessment (also known as MBTI®), created by Isabel Briggs Myers and Katharine Cook Briggs. Learn more about Personality Types or read another biography by clicking below. Carl Jung – Founder of analytical psychology. David Keirsey – Fine-tuner of the four temperaments. Howard Gardner – Developer of the theory of Multiple Intelligences. Take our test to learn your personality type, preferences and more. Includes career matches, strategies and charts.